What’s the definition of function? To me, function is a state where we pursue physical excellence without an inappropriate side effect. If a person specializes in a particular endeavor, there’s greater potential for side effects. But if that’s the plan, we can manage it. It’s really hard to define function, so we usually invert it and try to define dysfunction. We’re not trying to predict function. We’re trying to catch dysfunction in a bottleneck that may or may not add unnecessary risk or poor adaptability. When you can’t move well, how much can you learn about movement? It’s my opinion there’s a point at which great coaching cues don’t matter. Coach up a frozen shoulder and see how that works. Coach up a scoliosis and see what happens. If movement quality is so diminished that we can or can almost call it dysfunction, adaptability is going to be compromised. Even if the person isn’t at risk due to self-regulation and avoiding positions likely to cause injury, adaptability will be compromised. What is the point of exercise if we’re not going to become adaptable from it? What’s the point of investing your time in a movement endeavor if some capacity or competency isn’t going to improve? 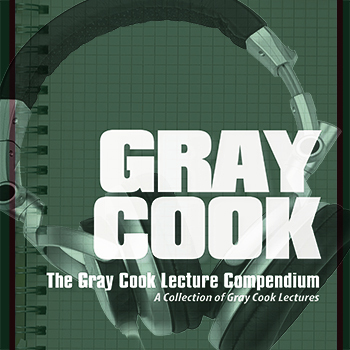 Need more movement philosophy from Gray Cook?